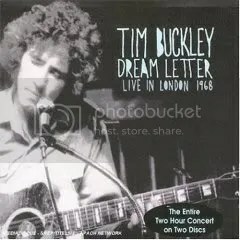 Many critics and fans have hailed Tim Buckley as one of the distinctive voices of the 60s/early 70s. That is true, but I always felt that his actual albums never delivered on the endless promise of that voice. There are moments of brilliance on his first six albums. From the earnest folk troubadour to the whacked catharsis of Starsailor, he hit plateaus matched by few others of the era. However, none of the albums qualified as classics, just classic moments. I always found myself grabbing for Fred Neil, Bill Fay and even Donovan records before Buckley’s because they were just brilliant through and through. A musical awakening arrived when a friend bought me Dream Letter Live in London for a birthday present. It was sort of an awkward time in my life as I found my way in a new city and emotions were unsteady. One I heard his version of “Dolphins”, Fred Neil went out of my playlist for awhile since Buckley’s version blew it up into some fantastical epic even more beautiful and melancholy than his version. Even songs I disliked in their recorded versions became favorites once I heard them performed in a live setting. This set finds hime improving on the recorded versions as he stretches out the structure of each track without delving too far into the caterwauling that sometimes turned me off. The first cd of this double whammy is pretty stellar, but the second disc really finds him mining some dark emotional spaces as he seems intent on exorcising some personal demons onstage. There is a track where “Carnival Song” segues into “Hi Lily, Hi Lo” It begins with a simple musing about the lack of carnivals in NYC and how it doesn’t mean much, but then starts singing about a lady named Lily who should come and join in with the festivities. It is a romantic request for his lady to get into the spirit and embrace the moment and dance with him. Yes, that sounds mundane, but I would dance with this fellow at monster truck showdown after this life-affirming track. It is a plea for happiness and triumph over depression that is delivered in such a tender fashion that it sums up the essence of love.